When you look at carpentry tool reviews, cordless sanders may not seem like a first choice. Even so, tools like the Makita LXOB01 orbital sander and others have made incredible strides. Some of our guys swear by them as they save tons of time in setup. Another unusual tool that has taken off is the cordless finish nailer. The RYOBI P360 Airstrike finish nailer was quickly followed by the DeWalt 20V Max angled finish nailer and others. Now, Milwaukee, Makita, Senco, and others have tools in this growing category. With these tools, you can get in and out without using a compressor or dragging an air hose. 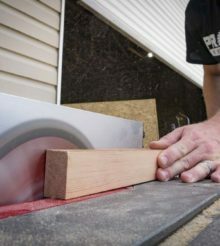 Our carpentry-focused reviews include miter saws, sanders, nailers, hand tools, and other woodworking tools. In carpentry, quality, convenience, and portability are key. A lot of times you deal with built-ins or other locations where you need everything on-hand. Newer cordless tools are helping, and so are advances in hand tools to do more with less. Above all, quality tools make the difference, so every tool gets a thorough exam against those high standards.